The First-Ever "Head Car Scuffing Machine" for the Shinkansen Bullet Train: Dexterous Force Control Replicated by "Japan's Engineering Prowess"
The Tokaido Shinkansen is often described as the pinnacle of Japanese technology. Still, car maintenance is critical to keeping her running safely and stably. The job of scuffing the head car, which is part of the required maintenance, is not only difficult because of the aerodynamic shape of this technological marvel but also dangerous because of the hard-to-reach areas. To make maintenance easier, safer and more efficient, JR Tokai introduced the first-ever "head car scuffing machine" for the Shinkansen at their plant in Hamamatsu, Shizuoka. But, how was this dexterity-demanding job automated? - Maintenance is critical to keeping the Tokaido Shinkansen running safely and stably as Japan's premier high-speed railway service between Tokyo and Osaka. 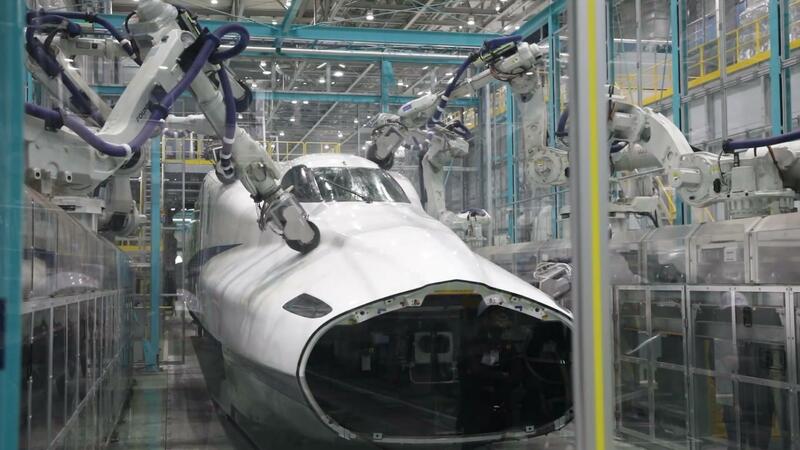 - Tokaido Shinkansen operator, JR Tokai, introduced the first-ever "head car scuffing machine" for the Shinkansen at their Hamamatsu plant, to improve work safety and efficiency. - Panasonic's skillful engineering was highly recognized as the new machine improved the work environment and greatly shortened work time. - What thoughts were behind development and the repeated process of trial and error of this first-time challenge? The Tokaido Shinkansen went into service about 55 years ago, just before the curtain was raised on the Olympic Games Tokyo 1964. 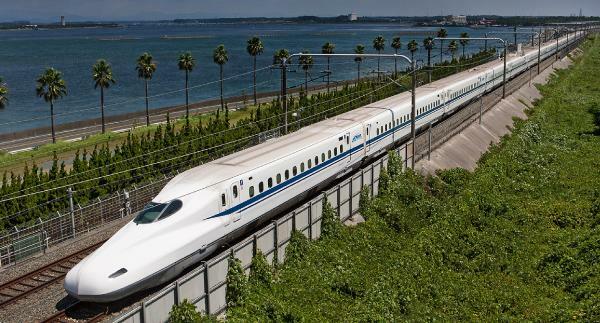 Symbolic of the strong economic growth Japan has worked hard to achieve, this high-speed train has continuously evolved with the times over this half century. With the Olympic and Paralympic Games Tokyo 2020 just around the corner, the Tokaido Shinkansen is averaging 368 trains a day (results from FY2017). That translates into one train every few minutes and testifies to its importance as a means of transportation for travelers and businesspeople alike. Moreover, the Tokaido Shinkansen offers passengers a comfortable ride and is known worldwide for departing and arriving on time. The N700 Series began operating in July 2007 and added the N700A as an even safer and more reliable model in February 2013. They increased speed even further to a maximum 285 kph in 2015, shaving off 3 minutes of travel time between Tokyo and Osaka. Today, the N700 Series and N700A are the most-worked head cars on the Tokaido Shinkansen Line. Buzzing up and down Japan's primary artery of transportation at this speed requires attentive maintenance. That is because passenger safety comes first. Tokaido Shinkansen operator, Central Japan Railway (also known as JR Central or JR Tokai), overhauls the cars at its plant in Hamamatsu, Shizuoka. As a part of that work, they detach key parts and inspect and service each unit and component in detail. Maintenance intervals are set to 36 months or 1.2 million km, whichever comes first. As of November 30, 2018, of the 133 Shinkansen train sets (16 cars per set) in JR Tokai's possession, 123, or over 90%, were of the N700 Series or N700A. 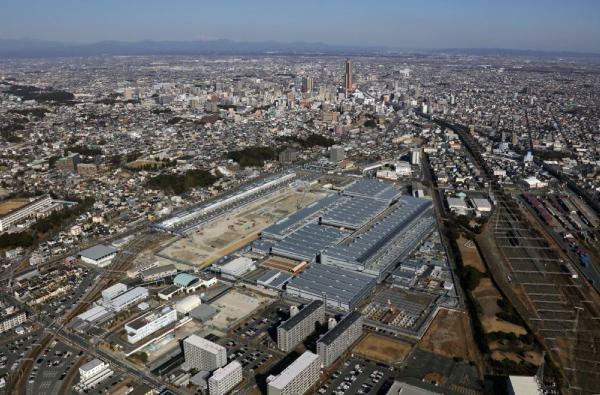 In the summer of 2010, JR Tokai began renovating their Hamamatsu plant. Having been built in 1912, the facilities were old, so it was announced that buildings would be replaced or reinforced to withstand strong earthquakes. The company wanted to be capable of overhauling their trains even in the event of a major quake. Given that this was the biggest renovation since the plant had been built 100 years before, it was also decided to "boost efficiency by introducing the latest equipment." The "head car scuffing machine" featured in this article was a part of that plan. 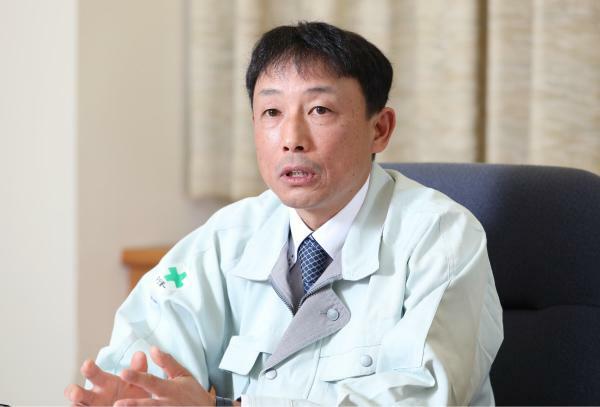 Toshinori Muramatsu of JR Tokai explained those intentions by pointing out that "renovating the plant gave us an opportunity to improve the 3D (dirty, dangerous and demanding) jobs we had inside." But, why does the head car need scuffing to begin with? Mr. Muramatsu answered that as follows. "Shinkansen trains are completely repainted at the Hamamatsu plant, but they run almost every day, so they get dirty, yellow and lose their shine. Since we want passengers to ride in comfort, we periodically wash the outside panels so that the cars are clean. We completely repaint the cars during our overhauls, but in order for the paint to stick to the cars and not peel, it is necessary to scuff the surface a bit prior to painting." Toshinori Muramatsu, Assistant Manager, Maintenance Dept., Hamamatsu Plant, Central Japan Railway Co., Ltd.
Scuffing has been done prior to painting since the first-generation 0 Series Shinkansen. And, because it requires a high level of skill, a department specialized in painting has existed since the days of JR Tokai's predecessor, the former Japanese National Railways. However, scuffing was a manual job and, when the N700 Series and N700A were brought in, the complicated aerodynamic shape of the head car made footing unsecure in spots and the scuffing dust and heat of summer compounded the stress placed on workers. 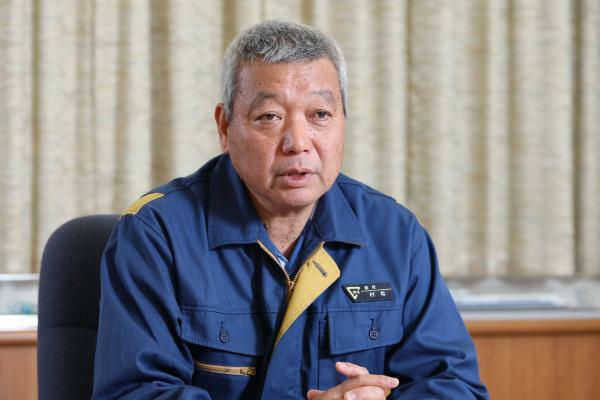 "We wanted to of course boost our work efficiency, but we really started exploring the idea of introducing machinery to scuff the head car because ensuring that work could be performed safely was our first priority," told Mr. Muramatsu. JR Tokai consulted Panasonic Environmental Systems & Engineering (hereinafter "Panasonic") about developing a machine for scuffing the head Shinkansen cars. Panasonic's Shunichi Ueda, who was placed in charge of the project, recounted, "When they came to us, we had absolutely zero experience with the Shinkansen, so it was equally a new challenge for us." Shunichi Ueda, Chubu Section, Production Environment Engineering Unit, Sales Engineering Group, Environmental & Air-conditioning Business Group, Panasonic Environmental Systems & Engineering Co., Ltd.
What JR Tokai was asking for was to scuff the surface by pressing brushes against it, which implied using technology for controlling the scuffing force. However, a uniform scuffing force could only work under constant conditions such as flat surfaces, therefore it was necessary to add a little spice to customize the process. "The objective was to evenly scuff all surfaces, but with conventional brushes, curves would not come out the same as flat areas. So, we reshaped the brush at the end of the robotic arm so that force could be controlled on curves, as well. We chose a brush shape that worked with the scuffing force, torque and speed, and even developed ourselves a compatible scuffing agent to go with it. Moreover, we incorporated original technologies into other parts to support force control, such as to integrate a pressure sensor into the brush, so as to ensure consistent scuffing quality," recalled Mr. Ueda. As is normally the case, things are easier said than done, as the development process required a great amount of time. It took, in fact, 2 to 3 years just to finalize the degree of scuffing that would ensure paint would adhere to flat surfaces without a problem. Verifications for curved surfaces did not start until after that. "When properly done, paint does not come off when tape is affixed to the surface and then peeled off. We repeated this widely used test until determining the degree of scuffing that worked best," tells Mr. Muramatsu. For verifications of curved surfaces, a full-scale mockup of a head car cut longitudinally in half was prepared by JR Tokai and used by Panasonic to conduct contact tests and hone scuffing control performance. Testing on actual train cars finally began in 2016. Looking back upon that moment, Mr. Ueda recalled, "When we had JR Tokai here to witness a test-run on an actual train car, we were all choked up with joy and a flood of emotions when they started applauding and shouting 'wonderful.'" The head car scuffing machine that was commissioned in July 2017 stirred a lot of talk as the first unit of its type to ever be designed and built for the Shinkansen. While for Mr. Ueda, it was a "cooperative project that moved forward only because of the collaboration from JR Tokai and their affiliates," Mr. Muramatsu spoke to the merits of new equipment by noting that "we've had it for almost two years and there haven't been any problems whatsoever. We have improved our work environment, greatly shortened the amount of time to scuff the trains and obtained the results we were hoping for." This is a classic example of how strong feelings of trust between the parties led to success. The head car scuffing machine is meticulous managed from these monitors. The scuffing machine consists of six arms attached with brushes at the end that dexterously remove dirt and oil while scuffing the outside surface of the train car. After a train car is slowly pulled into the scuffing booth, it looks something like a long-awaited shower as the dirt is removed and the surfaces readied for repainting. By automating work with the scuffing machine and improving inspection and servicing lines, JR Tokai shortened their overhaul process by one full day from 15 to 14 days. Given that more than 1,000 people are involved in overhaul work, this one-day reduction is, as Mr. Muramatsu puts it, "very fruitful." At some point, JR Tokai will commission the new N700S to the successor of the N700A. Because the shape of the head car will likely change, there is a strong possibility of an evolved version of the scuffing machine being developed from the know-how accumulated from this experience. Seen up-close, the way that the arms move is like art, a telltale sign that the "Japan's engineering prowess" is alive and well.